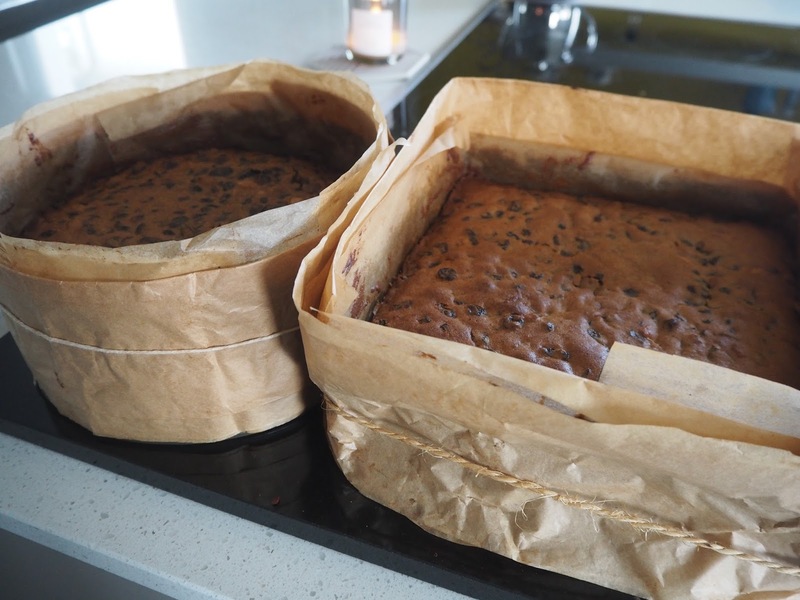 This is a bit off piste but I made my Christmas cakes last weekend and got SO many messages from people asking me for the recipe I use. So I thought it would be easier all round if I did a blog post showing you just how simple this Christmas Cake recipe is - and I can vouch for it with confidence as I've been making my cakes this way for 6 years. I made 4 cakes in total - 2 on Saturday and 2 on Sunday (for family!) and honestly, it only took me about an hour and a half each day. Admittedly, the cooking time is quite long but they don't really need any attention once they're in the oven so your work is done by then. But what if you've never made a Christmas cake before? 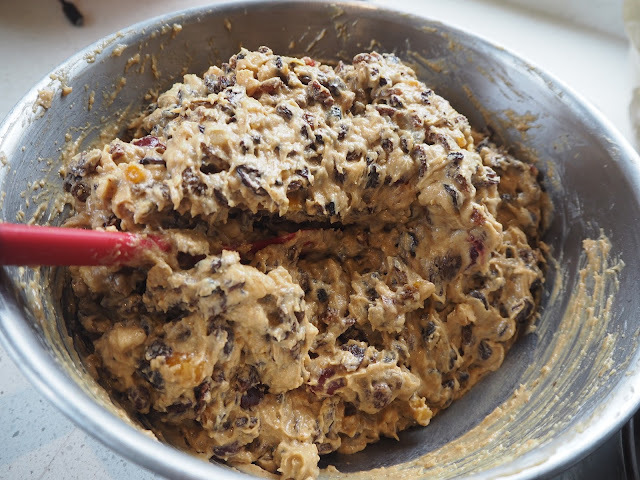 Don't worry.....every fruit cake has 6 simple steps. Soak your fruit in a little brandy/whisky/rum/lemon/orange juice. Cream butter and sugar. Add eggs one by one. Fold in your flour. Bung it in a tin. Cook slow and steady. And this recipe is exactly the same - with just a bit more quantity and some extra ingredients like ground almonds with your flour and lemon zest. The recipe has been photocopied from an old cook book belonging to my mum. 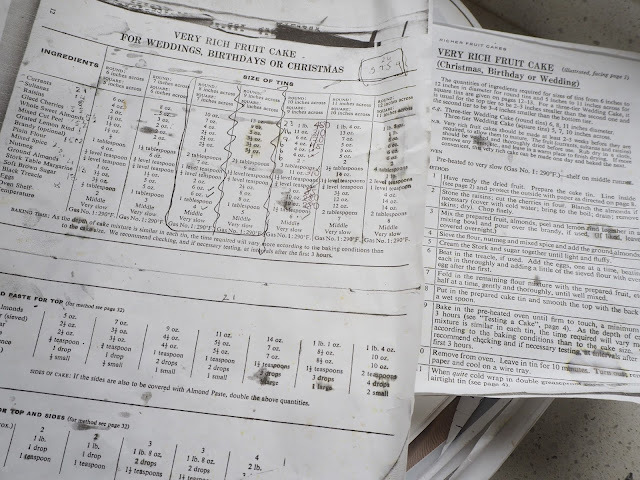 My dad has always done a bit of cooking and baking and I remember he would be on hand to help my mum with the cakes and puddings every October or November so his writing and calculations are all over this page. I have adapted slightly in that I don't use margarine - I use butter - and I don't use treacle. I also use a bag of mixed dried fruit rather than buying separate bags of currants/raisins/sultanas/mixed cut peel. I think the reason people are afraid of making Christmas cakes is because it did use to be a much bigger deal..not least because of the cost of the ingredients. You used to have to stone your raisins (😱) and blanch your almonds. You also had to wash and dry all your fruit. Such a palaver and I'm sure it took a long time and hit the grocery budget significantly back in the day. Some old recipes recommend boiling the fruit on the hob - an extra step that just adds to your washing up and your time (in my opinion). 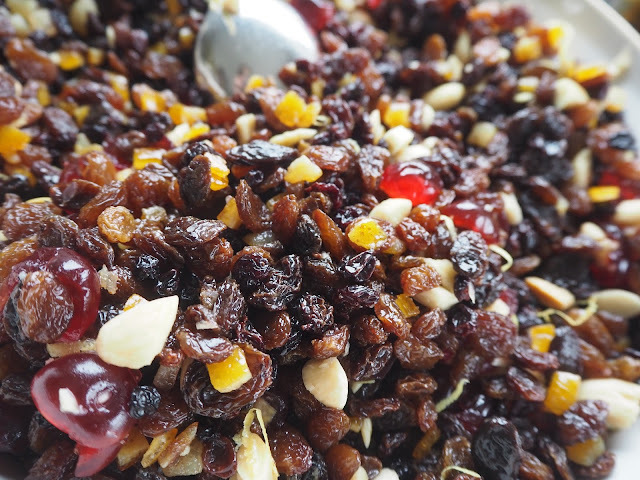 We have such great quality juicy raisins and sultanas now that we really don't need to do this though it does add to the flavour if you can soak your dried fruit overnight in brandy. I'm going to stop whittering on now and outline the recipe and step by step instructions. I've included the quantities in the instructions so that you don't have to keep scrolling up and down. 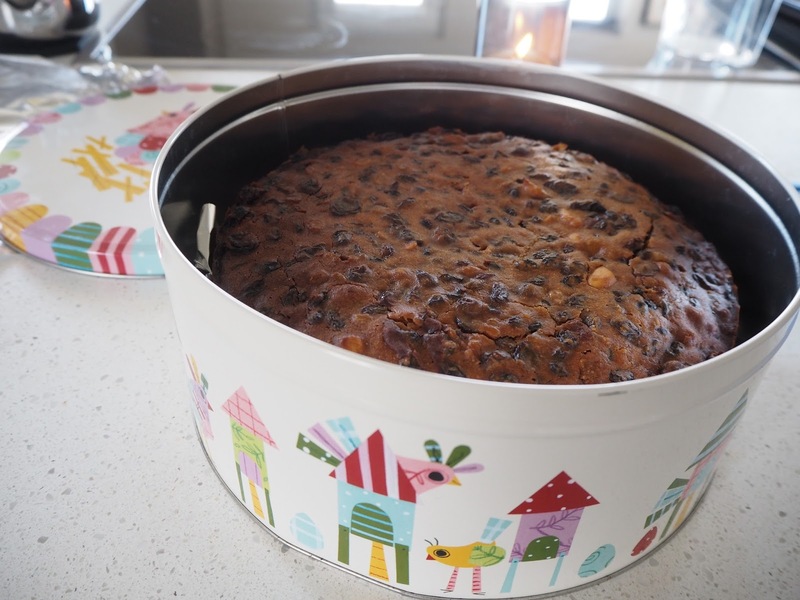 The recipe is for a 9 Inch Square / 10 Inch Round Christmas Cake as this size tends to use up complete bags of ingredients without too much in the way of leftovers that are difficult to use the rest of the year. 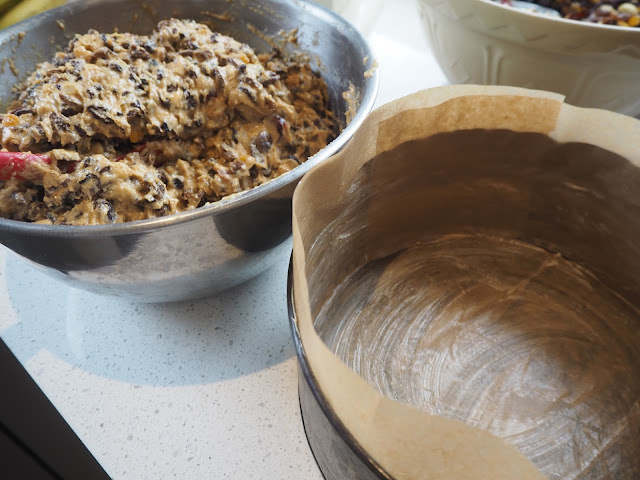 Remember, you don't have to actually make a cake that size - you can opt for a very tall 8 inch Round cake (which will take longer to bake) or even make multiple smaller round or loaf sizes out of the mixture. My amounts are a little unusual as I have converted from ounces to grams for ease of shopping in our metric day and age. 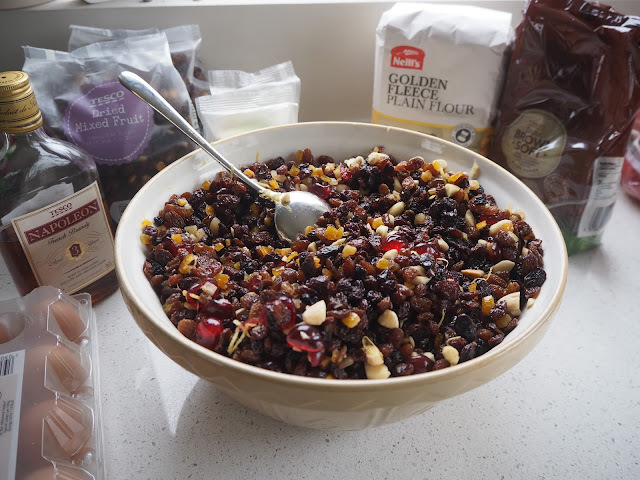 Take 1kg of mixed dried fruit, 110g of glace cherries (don't be afraid to add more or fewer as you wish), 110g of chopped up blanched almonds (i.e without their skin), the zest & juice of 2 lemons. Pour over 3 tbsp of brandy and leave to soak for as long as you can. Overnight is good. I just go with whatever time I have - it depends on how organised I am. Combine 310g of flour with 110g of ground almond, 2tsp of mixed spice and 1tsp of ground nutmeg. 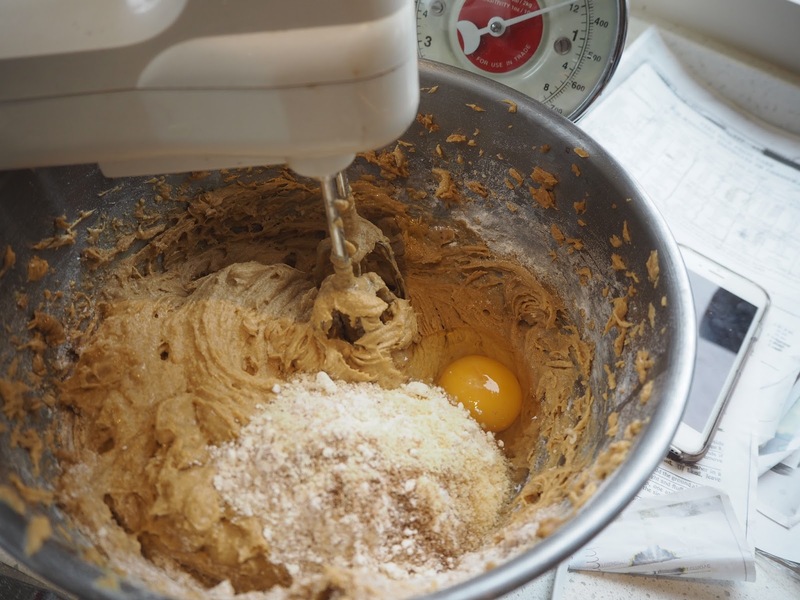 Add one egg to the creamed butter/sugar and mix it fully. Add 5 more eggs (6 in total!) one by one, adding a spoon of the flour mixture in with each egg. 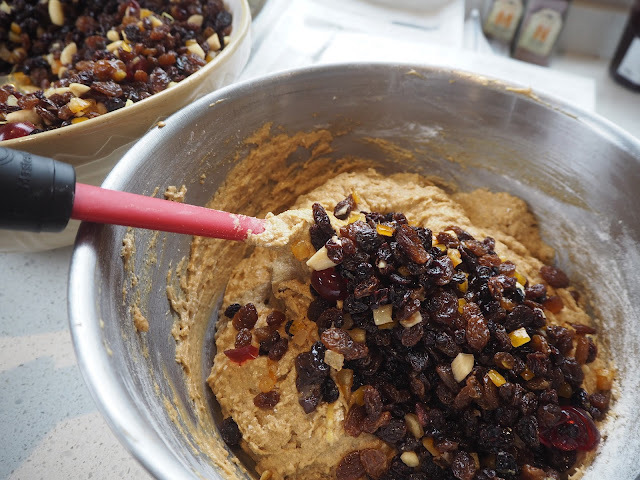 Once all the eggs are beaten in, fold in the remaining flour mixture followed by the fruit mixture that's been soaking (in two halves). 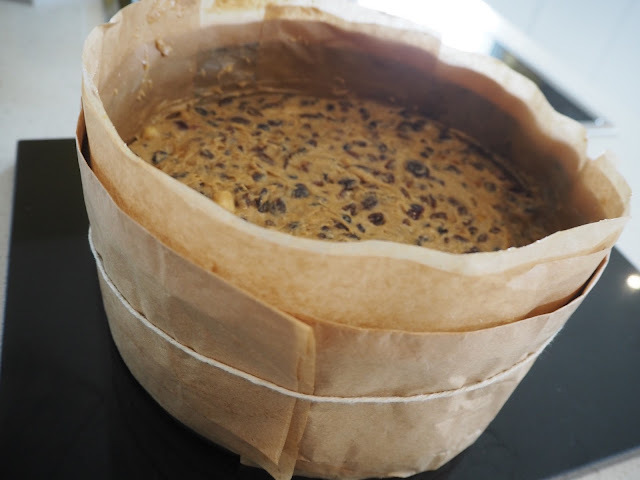 Put the mixture into a cake tin that's been fully lined with greased baking parchment. This is the worst part of the job. If you have any to hand, get kids involved in doing it while you're making the cake mixture. I also tie a folded piece of parchment around the outside of the tin to stop the edges overcooking. This is something I saw my mum do and I've no idea if it works. It looks lovely and kind of old fashioned. Cook in the middle of the oven at a temperature of 140C for 3 hours, checking after 2 hours to ensure the cake isn't colouring too much. If it is, cover with foil for the last hour and turn down the oven to 130C. To test once the 3 hours are up, skewer the cake at an angle going into the middle and if the skewer comes out clean, your work is done. If it's sticky, pop the cake in for another 20 minutes and try again. 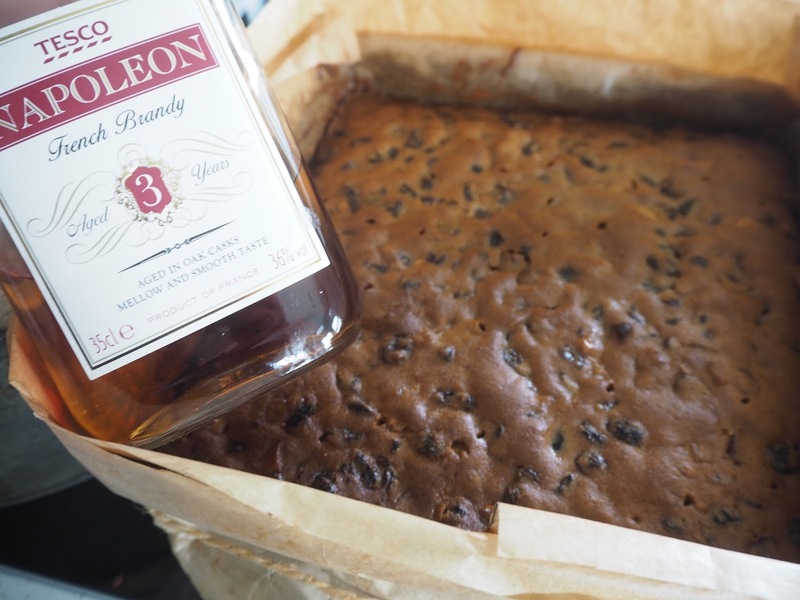 Once it's COMPLETELY cold, skewer the cake and pour over some brandy or whisky. Remember to buy the cheaper stuff for this...don't be wasting your Hennessy here. Wrap in foil and store in an airtight container in a cool dry cupboard until you're ready to decorate. These cakes, stored properly, will stay fresh for years. I always take our cake out about 10 days before Christmas and decorate with home made marzipan and royal icing. I'll add this process on to this blog post once I do it. The other thing we do in our family, in memory of my dear Father in Law, is cut the cake the week before Christmas and start enjoying it then. Because after all the palaver of making this cake, it's usually the LAST thing you want to actually eat on actual Christmas Day. But boy is it good in the week leading up to the big day! And it means it's already cut for you to easily leave a piece for Santa. 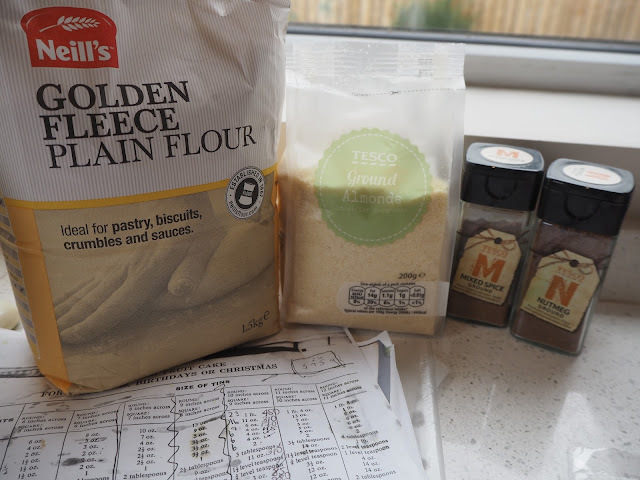 Please fire me over any questions you have - I hope it came across as simple as it really is and do please share with me if you actually make your cakes with this recipe. I am going to worry until I start hearing positive stories! I remember making something from a blog post a few years back but the blogger had made a mistake with the recipe and it was a disaster, wasting tons of ingredients in the process. I would be 😳 if that happened here! Though one thing I will say, be careful about being too good at this as you'll get stuck with making them EVERY year!!!! 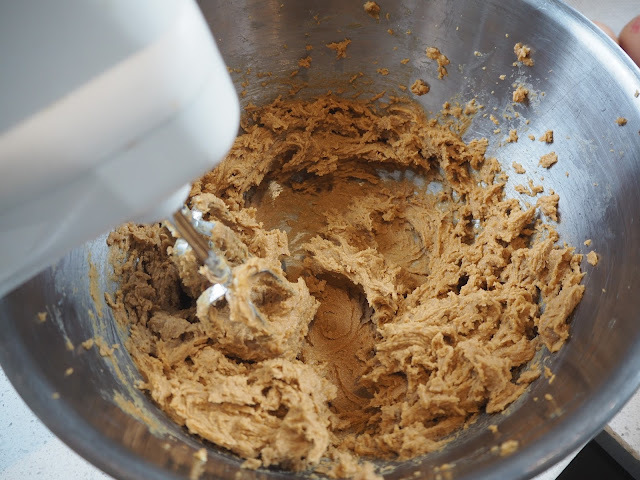 And there ends my baking lesson...back to clothes with my next post! I love the idea of cutting the cake a week before Christmas! We have almost given up making a cake as so few of us like it (I do!!) so it doesn't get appreciated!! Thanks for that Avril, I'm going to give your recipe a try. Really helpful to have the pics of the lined tins. I love the detail and how easy this sounds to make, i am going to give it a try😳. Can this be made at any time as I am thinking of mid November and I am not good with marzipan can it be eaten without icing? ?